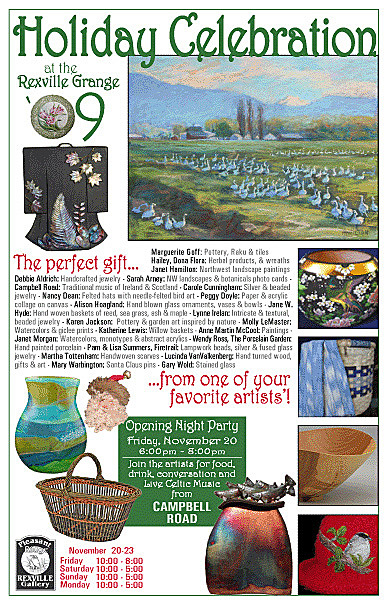 Katherine will be joining a wonderful group of artists for the Pleasant Ridge Rexville Gallery Holiday show on November 20-23. This temporary gallery comes together every November for a weekend at the Rexville Grange which is located at 19299 Rexville Grange Road, Mount Vernon, WA 98273. Really the Grange Hall is west of Mount Vernon, closer to the town of La Conner, just around the corner from the Rexville Grocery. Hopefully you can read the post card image to discover the great mix of artists and products that will be available. For basket lovers, there are two basketmakers involved – Katherine Lewis (of course) and Jane Hyde from Anacortes. There will be some outstanding pottery, paintings, jewelry, glass, turned-wood, felted hats, woven scarves, herbal products, and more. There is a special treat at the opening Friday night from 6-8pm. 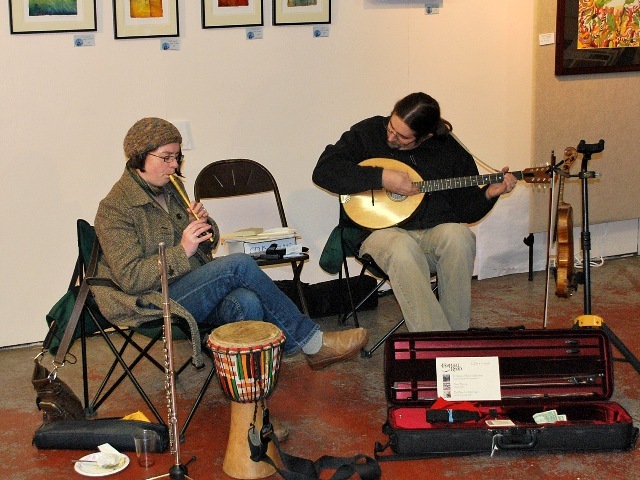 Jessamyn Tuttle and Jon Nauert of Campbell Road will be playing Celtic music. Join many of the artists for the music, drink, and conversation! This entry was posted in events and tagged arts & crafts, baskets, Campbell Road, craft show, Katherine Lewis, Marguerite Goff, Rexville, willow baskets by Steve@DunbarGardens. Bookmark the permalink.